Scrooge says 'Bah! Humbug!'? What is humbug? For Scrooge (and Scrooge McDuck!) Christmas is 'humbug' - a fraudulent commercial trick aimed at 'picking a man's pocket'. In general English 'humbug' describes insincere or hypocritical speech - Scrooge accuses all around him of only pretending to be interested in the plight of the poor. 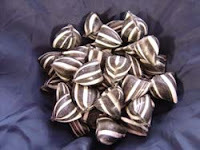 In British English, a striped candy/sweet. It's boiled and hard enough to crack a tooth. Dentists cry, 'Bah! Humbug! - all the way to the bank.